CENTILE Colloquium | Ask Jonathan! Last year Georgetown University Medical Center launched the Center for Innovation in Leadership and Education (CENTILE). In June I presented a poster at the first CENTILE Colloquium for GUMC Educators in the Health Professions. 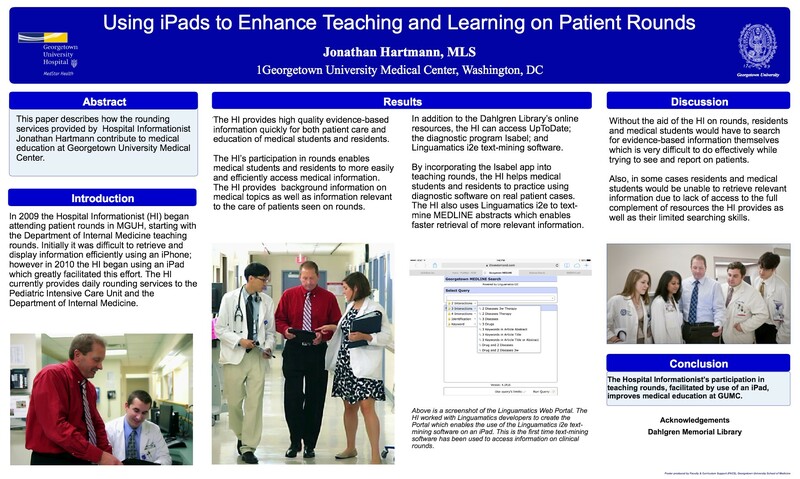 My poster Using iPads to Enhance Teaching and Learning on Patient Rounds explained how I have used iPads over the last four years on patient rounds to improve the education of medical students and residents at GUMC. I plan to continue to be involved with CENTILE in the future as I explore further innovative uses of technology in education. This entry was posted in Hospital Rounds, Medical Education, Medical Informatics, Medical Students. Bookmark the permalink.